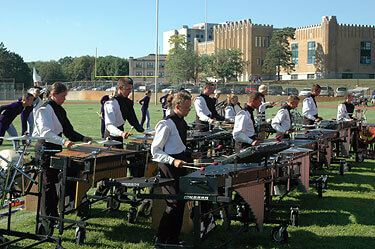 From a Southwind press release: The Southwind percussion staff is now in place for the 2007 season. Eric Willie and Shane Gwaltney will be joined by Seth Dahm, Robert Elston, Joe Hobbs, Craig Loeffler, Josh Nelson, Jason Palmer and Rob Pastor. Southwind's front ensemble July 15, 2006, in Battle Creek, Mich.
Caption head Eric Willie said: "We have filled our staff with quality performers and educators, but they are also role models for our students. The Southwind percussion program will continue to improve in both the quality of education for our students and the quality of entertainment for our fans." Read more about all of these Southwind percussion staff members at www.southwind.org.